Could be used in transistors and solar cells; "far more effective than silicon"
Max Planck Institute for Polymer Research (MPI-P) researchers have succeeded in producing long, structurally well-defined graphene nanoribbons (GNRs) with semiconducting properties. The “bottom-up” graphene synthesis method used consists in putting together molecular graphene building blocks to produce graphene nanoribbons in the desired shape and size. Unlike native graphene, graphene nanoribbons have electronic bandgaps, which allow for control of the movement of electrons and optical properties. They could be used in electronic devices such as transistors and could be far more effective than the silicon currently in use, the researchers suggest. “The liquid-phase-processable graphene nanoribbons might also be applicable in solar cells,” MPI-P Prof. Dr. Xingliang Feng told KurzweilAI. “The ‘bottom-up’ chemical synthetic approach employed in this work enables the fabrication of structurally well-defined GNRs in contrast to ‘top-down’ methods, which cannot precisely control the edge structure of the resulting GNRs,” he said. No information on possible future implementation in commercial fab processes was available from MPI-P. The European Commission has a budget of nearly €1 billion over the next ten years for its “Graphene Flagship” research program. The properties of graphene nanoribbons (GNRs) make them good candidates for next-generation electronic materials. Whereas ‘top-down’ methods, such as the lithographical patterning of graphene and the unzipping of carbon nanotubes, give mixtures of different GNRs, structurally well-defined GNRs can be made using a ‘bottom-up’ organic synthesis approach through solution-mediated or surface-assisted cyclodehydrogenation reactions. Specifically, non-planar polyphenylene precursors were first ‘built up’ from small molecules, and then ‘graphitized’ and ‘planarized’ to yield GNRs. However, fabrication of processable and longitudinally well-extended GNRs has remained a major challenge. Here we report a bottom-up solution synthesis of long (>200 nm) liquid-phase-processable GNRs with a well-defined structure and a large optical bandgap of 1.88 eV. Self-assembled monolayers of GNRs can be observed by scanning probe microscopy, and non-contact time-resolved terahertz conductivity measurements reveal excellent charge-carrier mobility within individual GNRs. 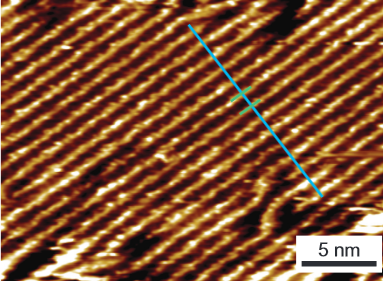 Such structurally well-defined GNRs may prove useful for fundamental studies of graphene nanostructures, as well as the development of GNR-based nanoelectronics.